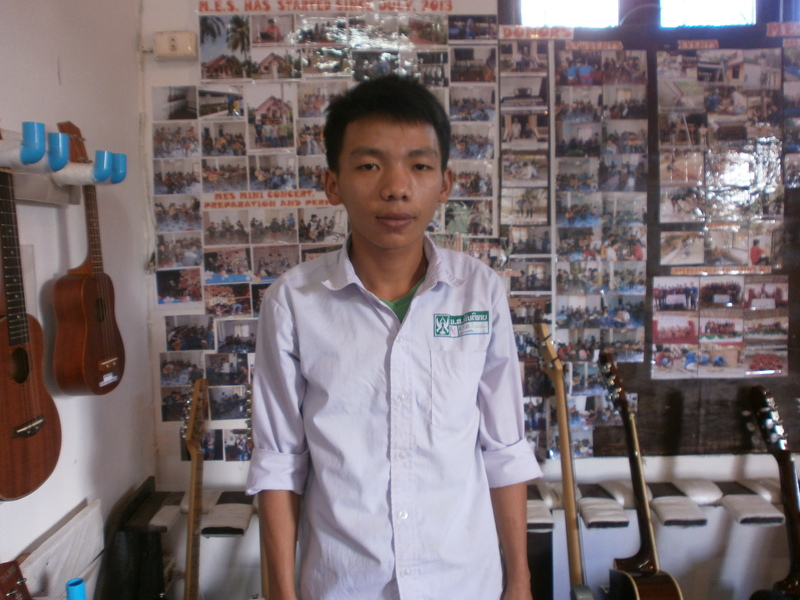 Hello, I’m Vansay Somboun “Max”, the director of Music for Everyone School “MES Laos”. I came from a small family in a small village about seven kilometers far from the city. I came to live in town for work and studies and I have been living in here since 2007. Before started MES, I’d been working as an English teacher and a teacher supervisor at http://mec-laos.org/. One day I met a friend who offered me such an opportunity to start MES. My passion is to help others as much as I can, and do something that I love and the answer is MUSIC. I’m so glad to see MES getting better every day. Happy to meet and work with many visitors and volunteers visiting and volunteering at MES. Happy to see how people enjoy, have fun coming and playing music. Happy that I can share my work with other many local people in Luang Prabang town. My name is Bounmee. I’m from a small village eight kilometers on motorbike. I’m graduated from technical college as an engineer. However, I’ve fell in love with music and in my free time I entertain myself by playing guitar and singing. I could already play some Lao song before I got to know MES, but after taking some lesson at MES I’ve learnt more important basic techniques. I’ve become MES staff members since 2013, but had to stopped my duty for about a year due to my health issue problem. I’m so glad to be back to continue what I love. I now help the students how to play several instruments that we have at MES. My name is Mr. Phonekeo Simyadeth and I’m from Paknga village, Phonexai dristrict, Luang Prabang province. Now, I’m studying at Teaching Training College in LPb. I’m very happy to be a part of Music for Everyone School and I’m enjoying my job. I help students learn how to play basic ukulele and I also practice drum and that’s because I’ll also help free levels students how to play basic drums. My name is Mr. La Soudaphone.I’m a student in the last year at high school. I love music so much and playing the guitar is my favourite hobby. MES is a wonderful place where I got my first guitar lesson started. After completing my last level, I learnt to play bass guitar and joined MES band. Today, I’m so proud to become MES staff member and help other people. I’m helping students how to play the guitar and ukulele. In the future, I want to become a musician. I am Saimany Phetvongxai and I am from a province in the north of Laos. I came to study in Luang Prabang town, I graduated from a college majoring in Business Administration. I’ve become a part of MES since August 2013. I start my work all day at MES and my roll is an administrator.